Did you know Bubble Tea received its name from the bubbles that formed on top after the tea has been shaken to mix all the ingredients together? Bubble Tea originated in Taiwan and consists mainly of milk teas. Here at Pochi, we actually expanded our definition of Bubble Tea! It's not just milk teas! 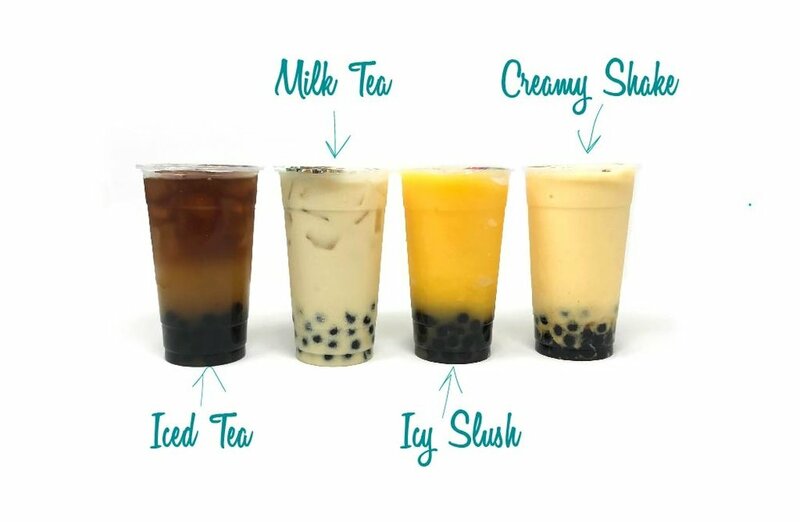 BUBBLE TEA, to us, is ANY drink with ANY topping(s) of your choosing. We have 4 different TYPES. Many of you ask us what the differences are. Hope this clarifies it a bit! We have Milk Teas, Iced Teas, Icy Slushes and Creamy Shakes. Iced Teas are, simply put, your flavored Iced Teas. Peach Green Tea or Passionfruit Green Tea are two of our most popular teas! Milk Teas are teas or flavored drinks with a non-dairy creamer base. The non-dairy creamer gives it its "milky" consistency. Not all milk teas have actual tea in it although you can always request that it does! Some do contain actual milk. However, like any drink on the menu, we have dairy-free alternatives as well. Our Original Milk Tea (Black Milk Tea) is the most popular of Milk Teas! We refer to Smoothies as Icy Slushes. Think ICY and SLUSH, even SNOW. Icy Slushes are frozen blended drinks and are typically fruit flavored! Strawberry Mango Icy Slush or Mango Pineapple Icy Slush are among the many combinations of slushes! Creamy Shakes to little surprise is creamy in texture and consistency. They are similar to milkshakes. We do not say they are milkshakes, because we do not always make them with milk. Like our Milk Teas, they are non-dairy creamer based but some drinks do contain actual milk. Unlike the Milk Teas, Creamy Shakes are blended. Examples of Creamy Shakes are Taro, Tareo (Taro and Oreo), Matcha and Honeydew. Most of our drinks are non-dairy as we use a non-dairy creamer. However, we understand that some are sensitive to ingredients in the non-dairy creamer as well. Any drink may be made with Soy Milk, Almond Milk, Coconut Milk or just Water as dairy substitutes. Alternative dairy options do affect the consistency of the drinks. Often times they have a lighter consistency and texture than the non-dairy creamer. Something to keep in mind when ordering. We also have LOTS of options for TOPPINGS. Toppings go on the bottom of bubble tea drinks. Tapioca Pearls or Boba are what most people typically think of when they think bubble tea. We have 23 options for Toppings!! We are redefining what Bubble Tea is and what it means to us so we can better serve our customers. Bubble Tea is any drink with any topping of your choosing. But, it is also more than that. It is the joy you feel from catching up with a friend or family member over some delicious bubble tea made your way.